As the school year gets underway, here are some figures comparing the situation of America's K-12 teachers to those of primary and secondary teachers in some other countries around the world. 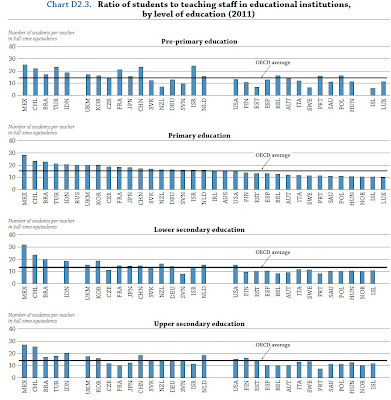 The figures are taken from the OECD volume "Education at a Glance 2013." The quick bottom line: the average U.S. teacher faces a similar student/teacher compared to the average for teachers in other countries, but the relative pay of US teachers compared to the average wage is lower than the similar ratio in many countries, and the number of hours worked by US teachers is higher than in other countries. First, here's a look at the ratio of teachers to students across countries: the top panel is pre-primary education, followed by primary education, lower secondary education, and higher secondary education. Next, here's a look at teacher pay. When compared in absolute dollars, the pay of U.S. teachers looks quite good by international standards--but after all, the U.S. economy generally has higher per capita incomes and higher wages than these other countries. Thus, the figure here shows the ratio of the pay of teachers to the pay of someone with a tertiary (that is, college) degree in these comparison countries. Finally, here's a comparison of the number of hours that teachers work in different counties, where US teachers are well above average, using the example of lower secondary school. The expectations of teachers and responsibilities of teachers can be quite different across countries, so it would be a mistake to view these comparisons as precisely apples-to-apples. But bring them up with a teacher of your acquaintance, and you'll get an earful of reaction.